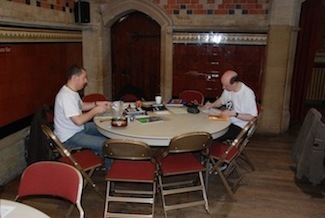 Andy 'Boozer' Holmes and Jason Mills prepare for the delve ahead. 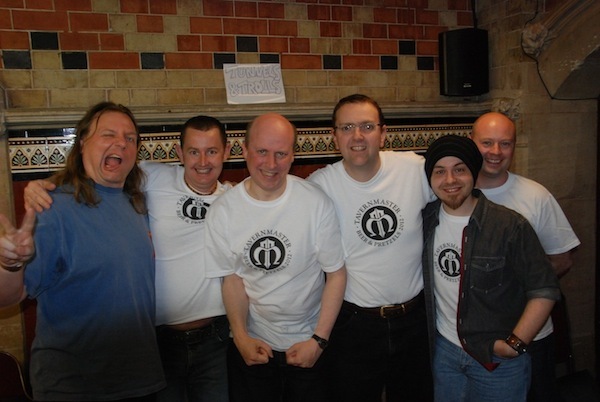 It's hard to believe that 12 months have passed since the last time I and a few T & T friends gathered at the fabulously atmospheric Town Hall in Burton for the Beer & Pretzels gaming weekend. This year, as well as me and Andy Holmes plus Jason Mills, we had Simon lee Tranter here for 2 days and we were joined by Andy James - Dekh from Trollhalla and the man behind the TunnelsandTrollsdotcom website. It's called Beer & Pretzels for a reason. Do I have to spell it out? 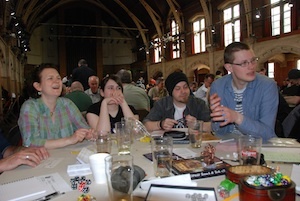 In addition to us 'old lags', we were also joined by Dan Prentice; Zanshin from Trollhalla, and his wife Sue. Both of them are veteran roleplayers and joined in the chaos with gusto, along with friends of Boozer and Jason; Del; Darren Jones, the writer of the T & T solo 'Temple at Marterine', along with his wife Karen and daughter Emily. With a young man called Tim dropping in as well there were 10 of us in total taking on what was envisioned as a stealth raid to try to rescue a young woman before she was sacrificed on some dreadful altar. 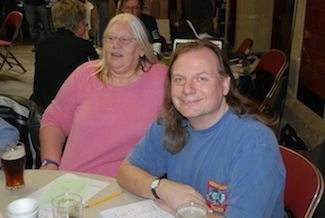 One of our Trollhalla friends - Dan Prentice (Zanshin) and his wife Sue - attended this year. The first law of being a GM is that the time taken to perform the simplest of actions rises exponentially with the number of characters involved. This was certainly true on Saturday when, despite Boozer's excellent efforts to keep us all in order, just getting through the door took almost 90 minutes! Give him his due, our GM tried to improve the odds by having some unseen beast tear the throat out of my human rogue before he even got across the threshold. What a swine! The 'Trolls' l to r: Zanshin, Boozer, Jason M, Darrgh, Ramsen & Dekh. 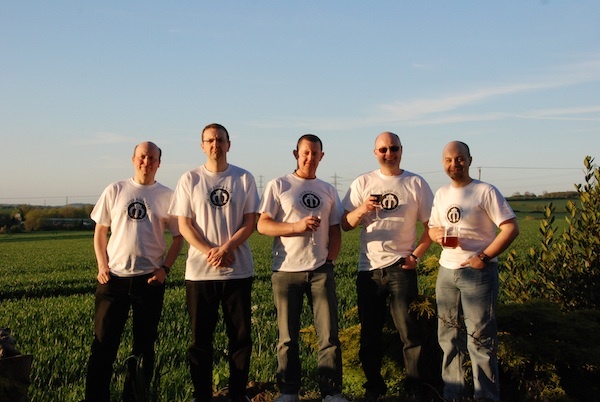 Note all of the Tavernmaster crew are proudly sporting their team t-shirts with Ramsen's BnP 2012 TMG design on. 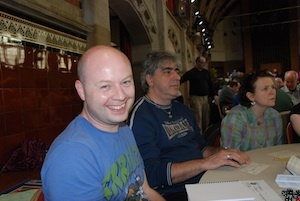 Dekh (Andy James) smiles for the camera while Del and Karen listen intently to the GM. Amid the pandemonium created by so many participants there is no doubt that some decent roleplaying took place. 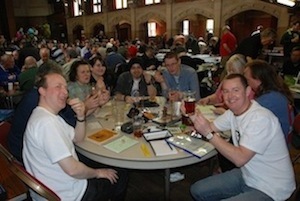 More than that, it was clear that the T & T table was having the most fun of anyone in the entire hall. Of the other RPGs being played most players looked on rather stoney faced while the chap running a 'Doctor Who' game looked to be taking things very seriously indeed. Karen, Emily, Ramsen and Tim displaying a mixture of emotions during play. With the rays of the setting sun casting shadows the Tavernmaster UK posse reflect on their day.